George have more than 25 years combined experience in complex litigation and a track record of successful outcomes for their clients. That track record is the result of extensive knowledge of the law and the processes involved in their clients’ cases. Such expertise benefits clients by lessening the risk of missing opportunities or compromising their legal rights, whether legal matters are personal or commercial. In business contract disputes, your choice of legal representation is extremely important. Many disputes involve complicated situations that are not easy to remedy. Mo and George use their decades of varied experience in a range of legal matters to resolve their clients’ disputes favorably and efficiently. Mo and George have successfully resolved civil litigation and arbitration matters for individuals, governmental entities and businesses ranging from Fortune 500 companies to small, family-owned operations. They focus on efficiently and cost-effectively addressing and resolving their clients’ legal needs. Mo and George’s practice includes collection of business receivables, commercial and business contract disputes, real estate litigation, homeowner/residential fraud, probate administration, will contests and trust constructions, and fiduciary litigation. It is critical to handle disputes as efficiently and strategically as possible, whether you are an individual or a business representative, a plaintiff or defendant. 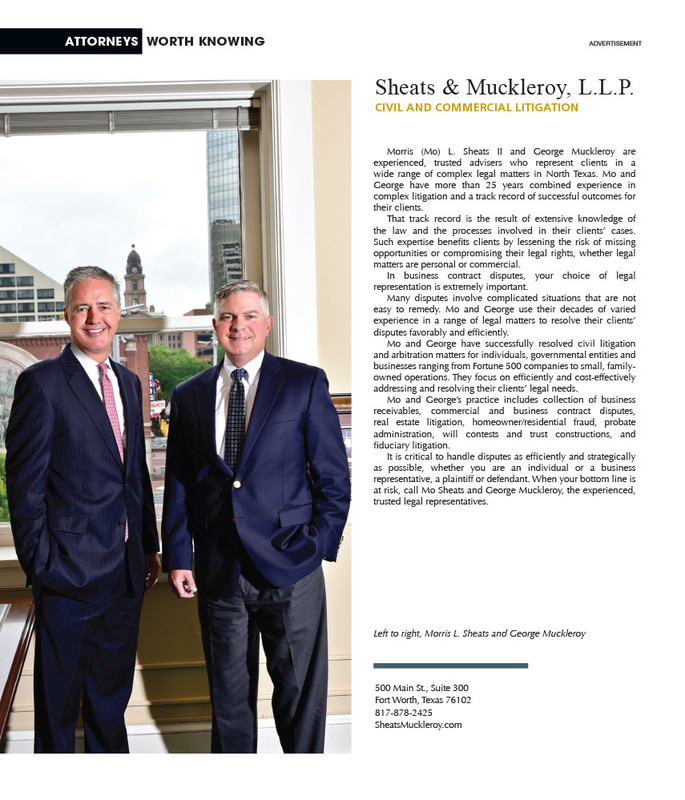 When your bottom line is at risk, call Mo Sheats and George Muckleroy, the experienced, trusted legal representatives.